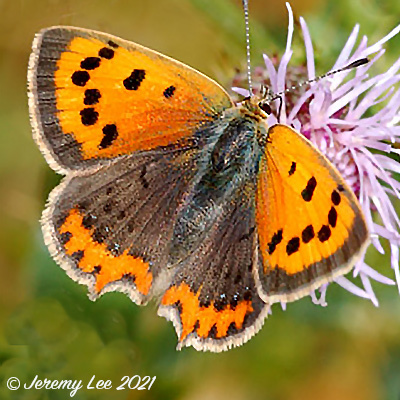 Lycaena phlaeas, more commonly known as the Small Copper, is a fast flying butterfly that, once settled, is unmistakable with the upper forewings a bright orange with a dark outside edge border and with eight or nine black spots. The hindwings are dark with an orange border. Some females also have a row of blue spots inside the orange border and are known as form caeruleopunctata. The undersides are patterned in a similar way but are paler. The black spots on the forewings are outlined in yellow and the dark colouring is replaced by a pale brownish, gray. The hindwings are the same brown/grey colour with small black dots and a narrow orange border. It is a widespread species and a familiar and welcome sight for many naturalists throughout the summer months. This butterfly occurs in discrete colonies throughout the British Isles, but is absent from mountainous areas and far north-west Scotland. Most colonies are fairly small, with just a few adults being seen on the wing at any one time.